Hi everyone! I just first off want to say thank you so much for the lovely birthday messages you've sent me. I'm not gonna lie, it's not something I was expecting and I actually got a bit emotional reading all of them. Maybe it is redundant for me to say it, but I really want to say how deeply I appreciate all of your love and support. As I told you before, I recorded an Outfit Of The Day (aka OOTD) video for my birthday, and I also included a reveal of a couple of special presents. My bling for the evening. Gold tones and Urban Decay Zippy glitter polish. This crystal quartz necklace is especially one of my favorite pieces of the moment. I got it from Hautelook (for a dang good discount) and the designer is Vivian Tamayo. I'm also lusting after similar crystal pieces like this and this. There's just something about rock crystal that is really cool and edgy, and matches everything I own. Birthday present reveal! This is the Michael Kors Blair rose gold watch that I bought during the Macy's Friend's & Family sale. The Macy's site listed the face as being 41mm but Nordie's and Dillards lists it as 39mm. No idea which is true but I think it looks nice on me even though I have tiny wrists. Also available in champagne, chocolate, silver, and silver with rose gold accents. And here is my bag reveal of what I got from Louis Vuitton in Paris! It's the Trevi PM in Damier Ebene. I love the pleats and how it has both top handles and a shoulder strap for versatility. It's my first and only LV purchase and I am totally in love with it! Here's what it looks like worn using the top handles. And my favorite way of wearing it, using the top straps which is much more comfortable and convenient. And of course, here are the two cameos from the vlog at the end of my video. And second is my long-haired Chihuahua, Cherry. She's a total sweetie! I hope you enjoyed my outfit and getting a little peek into my birthday activities with my family as well. It was truly a wonderful one this year and I feel so grateful to be with the people I love, and of course to be given the blessing of your love and support as well! Just out of curiosity, since the purse was a huge splurge for me, I want to know in the comments how you guys feel about big splurges on luxury items? Is it something you do and do you feel it's worth it? What was your favorite splurge purchase? Let me know! That cake is too cute to eat. Happy birthday. Good vlog. I really enjoyed that video. I think the watch was lovely. And of course, your outfit was very nice too. Once again, happy belated birthday Jen! :) And what a cute cake! It suits you perfectly. Happy belated Birthday!!! :] Your outfit, gifts, cake, family, and puppy are perfect~ hope you had a wonderful one! your birthday gifts are amazing! and that cake is too cute!! I'm glad you had a great birthday. You definitely deserve it! Your cake is absolutely adorable! I don't splurge on luxury items very often, namely because I work with a small salary and have issues saving because I tend to buy my friends and family small gifts all year round. If I go shopping and see something that I think you'd like, I'll buy it and give it to you the next time I see you. I am really terrible about that, haha. I'm generally not a fan of luxury splurges, unless 1) you are already saving well for emergencies and retirement, and 2) the item really adds to your life. I'm going to splurge soon on a trip to San Francisco. That's gonna be a lot of money spent, but I rarely take vacation, so the experience is worth it to me. I don't splurge often, although this year I splurged big time (for a student budget) to gift myself a small Chanel as my graduation gift. I don't mind splurging once in a while as long as I love the item 100%, can get a good use out of it, and the decision wasn't influenced by anybody else. Happy Birthday - hope you had a fab one! Your watch is gorg! I love your cake and your little cutie Cherry! Happy birthday, Jen! And both the cake and Cherry are just super cute! Thank you for all the videos and all the tutorials! Happy birthday!! You are so pretty and I love that LV bag! Please do more vlogs with Cherry! She is too cute! Love, love, love her! Happy belated birthday! 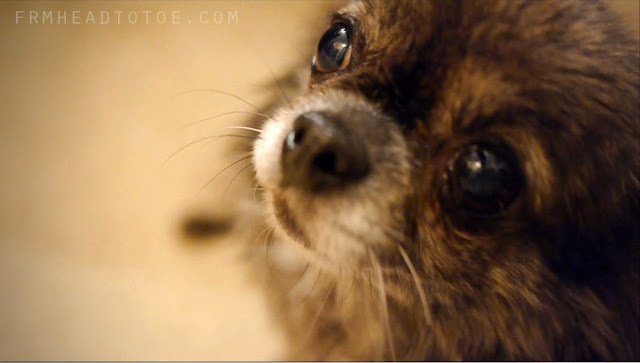 Your dog is adorable, and I think she should have more cameos in your videos in the future. I splurged a tiny bit this Christmas as a small present to myself for surviving my first semester of grad school and got myself the UD Naked palette. i recently bought my 1st LV bag and it's the same as yours! love my trevi pm! great choice, jen!!! I love how you match the colour of your accessories! The watch and the bag is gorgeous! Glad to hear you had an amazing birthday, Jen! I usually don't care for brand name bags, but I have to say, the Trevi looks really nice! It's a good size and shape. i commented on the yt vid but again happy bday and you look great! I've been enjoy your blog in 2011. Wish you more beautiful and stylish in 2012. Happy holiday! I love the whole outfit, Jen! Happy Belated Birthday, btw! I checked out CVS yesterday because you talked about the clearance sle and started following Nouveau Cheap - I never even knew CVS had those kinds of clearance deals...so thanks! 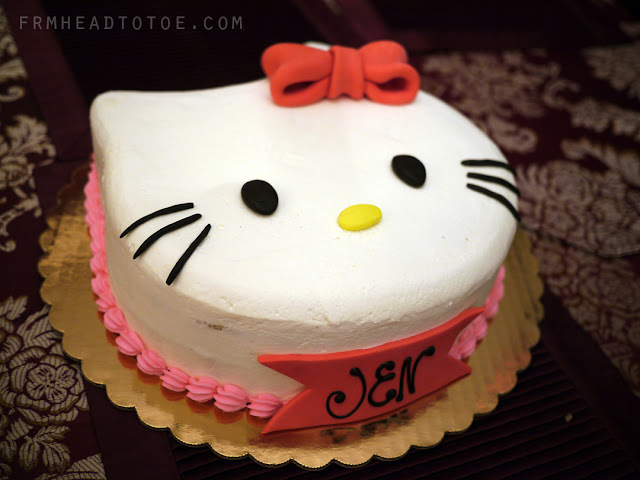 Btw, what a cute Hello Kitty cake!!! Happy bday girl! Your doggie is soooo adorable. I got the exact same MK Blair watch with the rhinestones, earlier this year during a Bloomies sale. I'm glad to see a fellow petite with tiny wrists loving the same watch. Enjoy your special day! Happy belated b-day Jen! Your watch is GORGEOUS! And I didn't know you had a doggy. She's so cute! Btw I've been wanting a chihuahua for some time now and seeing yours just makes me want one even more. But I heard they're loud. How's cherry in regards to that ? Stay as you are. You're beautiful and your blog is really interesting. Thanks and sorry my english isn't really good. Hello Jen! Happy belated birthday. Love your blog. I purchased a pair of JBrand jeans from Hautelook. They are the Pencil Leg Jeans in Jett (?). Basically they're a pair of black skinny jeans and the material feels so nice. They are in a size 23. I'd love to send them to you. I promise you I have never worn them before in my life, except when I tried them on and they choked the life out of me. I'm usually a 0 or 00, but I had never tried JBrand jeans before, so I guess for high end denim, I should have known better. In fact, I still have the original tags on them. Anyways, if you are interested, I'd love to send them to you. P.S. It's my birthday today (=]) Yay December kids! Happy birthday :) I wish you all the best for you. Happy belated birthday! Hope you had a great time and enjoyed yourself! happy belated and I just love coming to your blog from time to time, i'm the total opposite of petite, but i love your style, makeup and LOVE your personality. I think the way you shop, you deserve a splurge! You know how to find good deals, and use your money. Splurging a little never hurts. I do regret some purchases but your taste does change. I also LOVE your hair! how do you keep it lightly curled and natural looking? i think it's perfectly fine to spoil yourself and splurge once in a while. happy belated birthday jen! What a lovely post! You look very chic, and the hello kitty cake is just too adorable and your dog is so cute!!! I feel that it's ok to splurge more or less once in a while as a way to reward and pamper yourself to give yourself a nice break from everyday responsibilities. Happy birthday! Big splurges are okay once in a while and after consulting first with hubby. 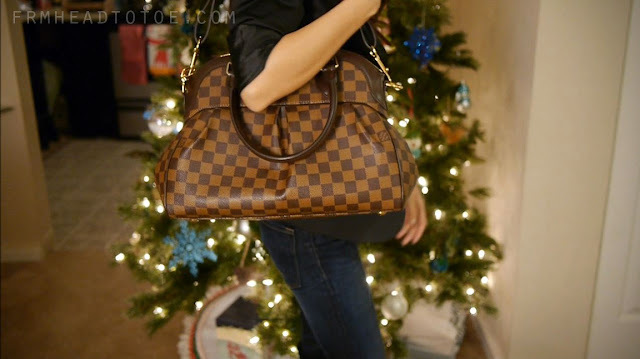 When i was still single and started working as a nurse Bought myself my first LV mono speedy 9 years ago and it was one of the best splurges, it still looks great to this day and the patina is now a beautiful honey color. Enjoy your beautiful bag! Belated Happy Birthday Jen! I hope your birthday was wonderful! I so love your outfit and definitely the watch! Can't wait for more tutorials! Handbags, especially LV, are timeless. With proper care you will never have to buy another handbag, ever. I actually am thinking of getting the same handbag! Happy belated birthday Jen! Hope you had a lovely day. Mmm...I think that luxury splurges are fine -- just as long as they're not frequent or regular (unless you absolutely need it). Also, I think it's really important to ask others or check out the internet for reviews on the products, since it's just a huge spend. A while ago I bought a Diorshow Extase mascara, and it did wonders :D but I found there were cheaper brands that could do better ._." Very cute bag Jen!!! Happy Birthday! I wanted to also say thank u... a few years back when I was in high school you did a video about how u suffered with acne and how your outside doesn't determine what makes u beautiful.... It helped me so much because I was suffering with severe acne at the time. Hi Jen! I've been following your blog quite a while :) first of all, Happy Birth Day!!! Second of all, love your outfit and your LV! Spending money on a big luxury splruge is totally ok and everybody deserves it. I own a couple of luxury purses and have worked hard for each one of them. Happy belated birthday Jen.. This is my first time ever posting on your blog but I've been following you for a couple months now and I just want you to know that I really enjoy watching & reading your stuff... I wanted to see if you could possibly review the MK watch. I just got one for christmas and well...I didn't get the one w/crystals but I've read reviews & people have said that the crystals fall off. I really do like the one you have so I'm thinking about exchanging but I dont want to exchange if the crystals are going to fall off.. If thats the case I'd rather keep the more simple one I have. Also, I found that removing 2 links off my watch is still too big (I have small wrists also) so the watch slides half way down my arm but if I remove 3 then the watch stays in one place and does NOT move at all.. Did you by chance encounter this problem? hey how old are you? I'm a long time reader but it's my first time to comment. I wanted to ask you a question.. I know that you have been using your MK watch for a while now. Does it wear off? I've seen quite a bit of reviews saying that it wore off. I know I'm a bit late on the trend but I'm contemplating if I should get one during this shopping season. Thanks again for your awesome work! I don't wear mine everyday but I have heard that the plating does wear off after time for others. Mine still looks great though! I love all the clothing accessories you have, escpially the Louis Vuitoon bag . My daughters wear some of these pieces of clothing. They are at that age when they want to dress a little more girly. My wife and I try to keep their styles appropriate but we know some great ways to find Cute Clothing that they like. We usually get them a lot of clothes for Christmas and we do most of the shopping online because most sites have a great selection. Acne Update & Clearasil Review (and giveaway)!